Labor Secretary nominee Alexander Acosta will head to the full Senate floor after clearing a cloture vote to avoid filibuster on Wednesday. The Senate voted 61-39 to advance Acosta to a vote expected for Friday. Acosta was confirmed easily to three prior positions in the federal government, including a brief stint at the National Labor Relations Board. His nomination for labor secretary has garnered more opposition from Democrats, as Senate Minority Leader Chuck Schumer (D., N.Y.) pledged to block President Donald Trump's cabinet appointees. 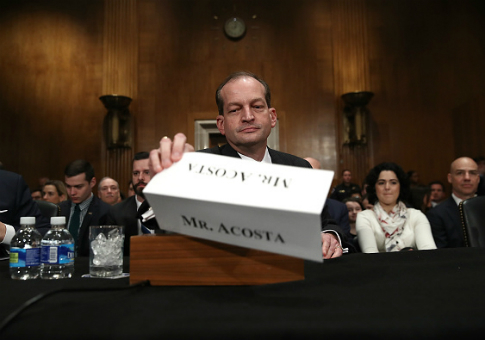 Acosta cleared the Senate Committee on Health, Education, Labor and Pensions on a 12-11 party-line vote in March. He attracted bipartisan support from Democratic senators during the cloture vote, especially Democrats up for reelection in states Trump won in 2016. Democratic Sens. Bill Nelson (Fla.), Joe Manchin (W.V. ), Jon Tester (Mont. ), Claire McCaskill (Mo. ), and Heidi Heitkamp (N.D.) joined the 52-Republican majority to advance Acosta. Bob Menendez (N.J.), Mark Warner (Va.), and Catherine Cortez Masto (Nev.) were the only Democrats who voted for cloture from states won by Democratic nominee Hillary Clinton. Sen. Angus King (I., Maine), an independent who caucuses with Democrats, also voted for the nomination. He is up for reelection in 2018 in a state that gave one of its four electoral votes to Trump—the first time the state has ever split its electoral votes, which are awarded based on the state-wide popular vote and the popular vote in its two congressional districts. Acosta is one of the last cabinet nominees to reach the Senate floor and was Trump's second choice for the position. Andy Puzder, former CEO of CKE Restaurants, the parent company of the Hardees and Carl's Jr. restaurant chains, withdrew from consideration in February. Puzder was the first career businessman to become Secretary of Labor since 1981 and received intense scrutiny from labor groups. His company was hit with 30 unfair labor practice complaints in the wake of the nomination and his wife received a package full of white powder in January. Trump tapped Acosta for the position within 24 hours of Puzder's withdrawal. The Florida International University law school dean attracted less opposition from unions and their allies. He won endorsements from several major unions, including the Laborers International Union of North America, International Union of Operating Engineers, and International Association of Fire Fighters. Sen. Patty Murray (D., Wash.), ranking member of the committee that first considered Acosta, took to the Senate floor following the vote to condemn his nomination. She said the Senate's "standard cannot be ‘not Puzder,'" and predicted Acosta would "defer to President Trump" on economic policies. "I have serious concerns," Murray said. "We need a secretary of labor who will prioritize workers … over special interests and political pressure." Acosta's nomination is open for debate for up to 30 hours before it will go up for a vote. He needs a simple majority to be confirmed to the cabinet. A Senate Republican aide told the Washington Free Beacon that Republicans expect Acosta to sail through the final confirmation vote. This entry was posted in Politics and tagged Alexander Acosta, Department of Labor, Secretary of Labor. Bookmark the permalink.